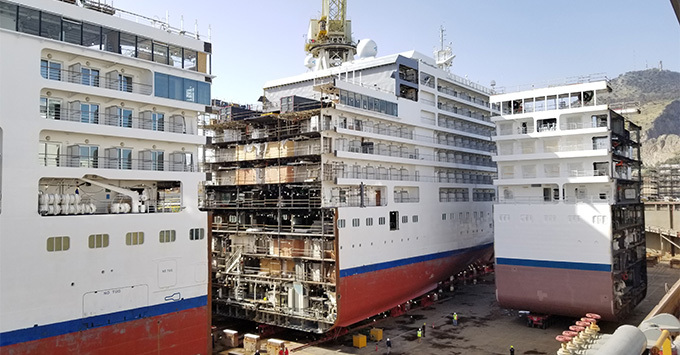 (10:20 a.m. EDT) -- With a little pomp and circumstance, shipyard workers Saturday applied the final cut to Silver Spirit, slicing the ship in half as it begins its nearly two-month refurbishment that ultimately will add more cabins and more space. The procedure, referred to as "stretching" in cruise ship parlance, had workers at Fincantieri shipyard in Palermo, Sicily, precisely cutting the vessel through the midsection, then adding in a 49-foot-long piece that will provide more space both indoors and out. The massive undertaking will be complete in May, and Silver Spirit will sail its first post-refurbishment sailing beginning May 6 from Rome. 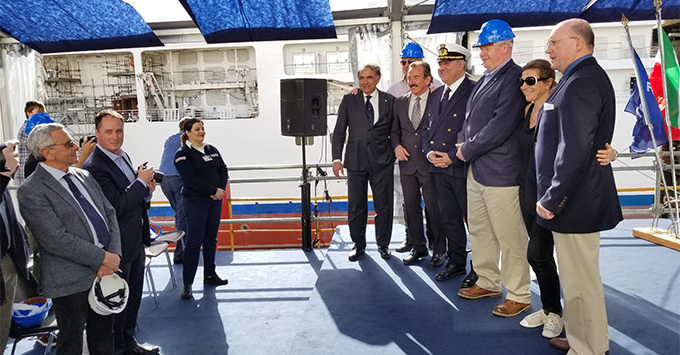 The stretching kicked off Saturday as Silversea and Fincantieri executives welcomed media, travel agents and invited guests (including Palermo's mayor) to the shipyard to watch as workers on a cherry picker sent sparks flying while making the last cut on the ship. Then, the front of the ship slowly -- and precisely -- rolled forward on an elaborate series of sleds and blocks. Sunday, workers using a series of hydraulic lifts inserted the new ship section into place, where it will be painstakingly welded back together. When all is said and done, Silver Spirit will grow from 195.8 to 210.7 meters long. The ship, which debuted in 2009, will accommodate 608 passengers, up from 540, and will grow to 39,519 gross tons (from 36,009). While the ship will still be smaller than the line's biggest vessel, flagship Silver Muse, it will carry more passengers. But what excites Silversea executives more than just the raw numbers is the flexibility the space gives its passengers. "All this extra space … This is really a part of the luxury experience," Christian Sauleau, executive vice president of fleet operations, said. With the addition of the new section, Silver Spirit will increase restaurant capacity by 15 percent and provide 20 percent more outdoor seating than before. The pool also will grow from 30 meters to 45. While the stretching is the flashiest part of the refurbishment, which Chief Marketing Officer Barbara Muckermann says costs "north of $70 million," it accounts for less than 50 percent of the project, which will include a complete overhaul inspired by fleetmate Silver Muse. Silver Muse debuted in 2017, and Cruise Critic's editors named it the Best New Luxury Ship of the year. A hallmark of Silver Muse is the wide variety of restaurants, something that will be replicated on Silver Spirit, which will emerge from the drydock with eight restaurants, including Atlantide, Indochine, Silver Note and Spaccanapoli. These four new-to-ship venues will join the existing Seishin, La Dame, La Terrazza and The Grill. Silver Spirit also will add the Arts Cafe, a bustling spot on Silver Muse that gives passengers a chic spot to plop down and enjoy lattes and pastries while reading or chatting. At night, it will be a cocktail lounge. It also will add another public space: Dolce Vita. The space will host live music and serve as a casual spot to relax. Virtually all of Silver Spirit's decor will see an overhaul, which will focus on modern light and bright style rather than the ship's current dark and bold scheme. Suites will receive state-of-the-art technology and entertainment, including HD interactive TV screens. Silver Spirit will also get The Zagara Spa (replacing the Spa at Silversea) as well as a new, enhanced fitness center. To improve the ship's mobility, workers are installing a stern thruster. When asked if Silversea had plans to stretch any of the line's other ships, Muckermann replied, "Not yet."